Dial Tech Science Co., Ltd.
1. With magnetic shielding against radiation. 2. Direct connected eletrode on ferrite core. 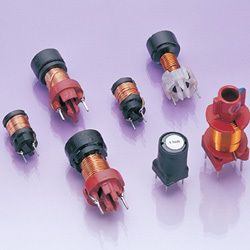 (1) Inductance range: 4uH to 1000uH. (2) Current rating: based on the inductance in 70% of its nominal value and temperature rise (⊿t)=40 or lower. (3) Operating temperature: -30℃ to 80℃. (4) DC / DC converters.